Researchers from the University of Utah and the Israeli Technion developed a new kind of Spintronics OLED device known as a spin-polarized OLED, that can be brighter than regular OLEDs. This bipolar spin valve device is similar to regular spin valve, but it emits light rather than just adjusting the flow of electrical current through the valve. Using a magnetic field it's possible to align the spin of the electrons and the electron-holes in the organic materials, which then supports more current and become brighter. 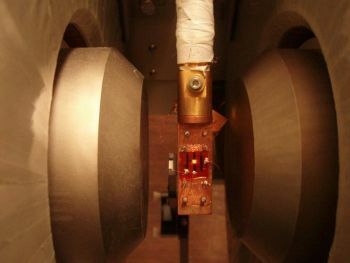 The Spin OLED uses a cobalt and lanthanum strontium manganese oxideelectrodes, while the organic layer is a polymer known as deuterated-DOO-PPV (this is the emitter layer). The whole device is only 300 microns wide and tall, and just 40 nanometers thick. The current prototype device emits orange light, but the researchers say that in the future they'll be able to produce other colors as well. In fact it may be possible to control the light of the device using changes in the spin of the electrons, which would be very useful. They estimate that this technology is about five years before it could be commercialized - one of the challenges is enabling it work at room temperature (currently it requires a temperature of minus 28 degrees Fahrenheit - or -33 Celsius).